It’s been thirteen years since we last saw Shaun, Ed and the rest of our favourite zombie-bashing Winchester regulars. However, the hilariously British depiction of one man’s reaction to the apocalypse still has an undying place in our hearts. Simon Pegg and Nick Frost were on peak double act form as they slew the undead with vinyl, wit and plenty of pints. I don’t know about you, but comedy-horror Shaun of the Dead will be on my Halloween re-watchlist this year. Jigsaw who? Amazingly, comic geniuses Pegg and director Edgar Wright once cooked up a thoroughly excellent idea for a sequel. Although he has modestly described the idea as ‘pub talk’, there feels like a lot of genuine potential and if there’s anyone who can pull off a madcap idea and make it into a cult classic, it’s these chaps. During an interview Entertainment Weekly, Pegg, Frost and director/co-writer Wright reflected on the cultural impact and legacy the ‘rom-zom-com’ – originally named Teatime of the Dead – has had. I jokingly wrote a treatment for From Dusk Till Shaun, which was a sequel to Shaun of the Dead. It was all about Shaun and Ed having to go up to Edinburgh, or something. I don’t know. It was ridiculous. And it was a joke. It wasn’t like a serious pitch. Edgar thought it would be funny to do the film again, but with vampires. But it was all just pub talk. BREAKING NEWS: Shaun of the Dead is still a real good time. There was a brief idea we had, that we entertained for all of like 72 hours, where I thought you could do an alternate reality sequel. It basically starts with the same movie but then it becomes not about zombies. But these films, they take three years. So, it’s like, if you’re doing another movie, let’s do something completely different. The guys went on to make the fantastic Hot Fuzz and The World’s End, so you can’t really fault their creative decision making. However, how cool would it have been to see Ed and Shaun take on the Count Dracula of 21st century Edinburgh? 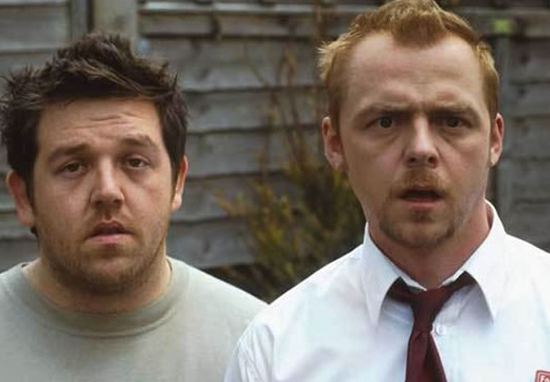 Shaun of the Dead was inspired by an episode of Spaced, entitled Art, where Simon’s character Tim hallucinates while fighting zombies after a heady cocktail of amphetamine and playing too much Resident Evil 2. However, there are also some more unlikely inspirations behind the BAFTA nominated film, most notably the grand high wizard of the charmingly-awkward wedding scene himself, Richard Curtis. We didn’t want to parody zombie movies. We wanted to make a zombie movie. We wanted to parody the rom-com. [Love Actually writer-director] Richard Curtis is a lovely man. But we pitched it as ‘Richard Curtis shot through the head’. Oh and according to Edgar, the role of Shaun’s mum Barbara was offered to Dame Helen Mirren. However the lauded thespian apparently declined, insisting, ‘I would only do the movie if I got to play Ed’.